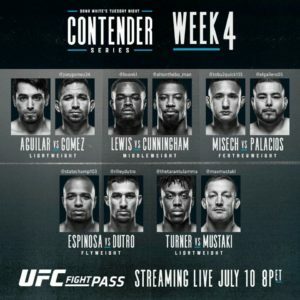 The TUF gym in Las Vegas, Nevada, hosts week 4 of the 2018 Dana White’s Tuesday Night Contender Series. 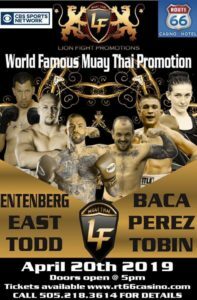 This weeks 5-Fight Card is headlined by undefeated Joey “Tasmanian Devil” Gomez against short notice replacement, former LFA champion Kevin “The Angel of Death” Aguilar. Gomez, fighting out of Hawaii, has 6 finishes in his 7 victories 4 by submission. Rafael Fiziev was originally scheduled to face Gomez, before needing to be replaced by Texan Kevin Aguilar, the LFA Featherweight champion. Aguilar defended the LFA Featherweight title 3 times, twice by knock out. *This week Jordan Espinosa & Bevon Lewis earn UFC contracts.